I don’t have you tell you how much I love my job, as I’m sure you already know. 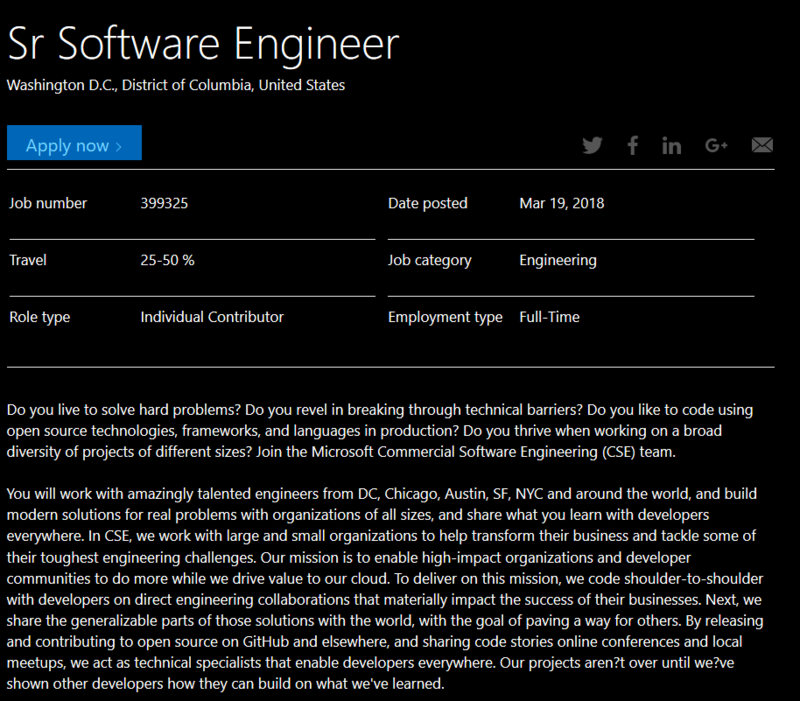 I work on the Commercial Software Engineering team at Microsoft, where we build cutting-edge solutions with customers and partners around Microsoft’s newest technology. The role says Washington, DC, but it’s for the Mid-Atlantic region as a whole. There are other roles throughout the U.S. as well. If you have ADHD and like to code, it’s fantastic. There’s a bit of worldwide travel involved, which I love as well. Best of all, we are often picking the projects we want to work on and the technologies we’d like to focus towards. As of late, most of my work has been around AI/ML as well as Docker and Kubernetes. If you’re interested, feel free to reach out to me, but also apply directly through the LinkedIn article above.